This image appears as VIEW-2474 in the collection of Wm. Notman & Son at the McCord Museum in Montreal. Search under "BOHEMIAN"
"William H. Rau, Photographer" "Philadelphia, Penna" "25"
Reverse (handwritten): "No. 26186. Canada - Montreal. 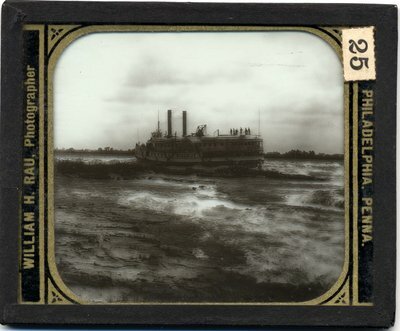 Steamer Bohemian shooting Lachine Rapids"